“… Society is always trying to control, to shape, to mould the thinking of the young. From the moment you are born and begin to receive impressions, your father and mother are constantly telling you what to do and what not to do, what to believe and what not to believe; you are told that there is God, or that there is no God but the State and that some dictator is its prophet. From childhood these things are poured into you, which means your mind – which is very young, impressionable, inquisitive, curious to know, wanting to find out – is gradually being encased, conditioned, shaped so that you will fit into the pattern of a particular society and not be a revolutionary. Since the habit of patterned thinking has already been established in you, even if you do “revolt” it is within the pattern. It is like prisoners revolting in order to have better food, more conveniences – but always within the prison…. “You see, all reformers – it does not matter who they are – are merely concerned with bettering the conditions within the prison. They never tell you not to conform, they never say, “Break through the walls of tradition and authority, shake off the conditioning that holds the mind.” And that is real education: not merely to require you to pass examinations for which you have crammed up, or write out something you have learnt by heart, but to help you see the walls of this prison in which the mind is held…. 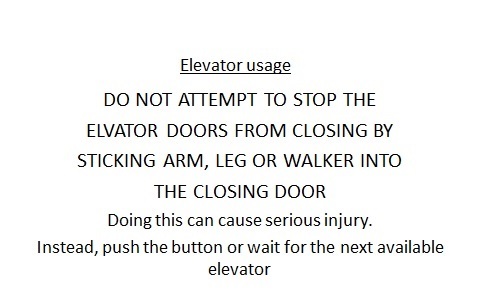 No matter how many times elders press the button for a new elevator, the doors will still make exit and entry unsafe! How do we escape the “walls of programming” that imprison us all? Krishnamurti (1964). Think on these things. New York, NY: Harper Perennial. So sad that we go along and follow some rules or policies that make no sense! Thanks for this wonderful post! Thank you, Lynz. It is sad and really needs to change! Wow, no words Carol!! this is very deep, Thank you very much indeed! I believe incivility inherent to our human condition. It is however, that some are better adapted to resist its urge. You may be right, Peter. One needs only to look at history and our current times to find confirmation of great cruelty, yet there are also examples of great kindness that are not mentioned as often in history texts or by media. It’s troubling that we live in a world that celebrates profit rather than compassion. Anarchy: not chaos. but anarchy, or true individual freedom from the elite, insane systems of government/monetary/economic/religious systems, which most people have been conditioned to believe humanity cannot live without. As Krishnamurti points out, attempting to change the system from within is to remain in this prison. We need to crash through the walls of this age old system of mind control, this illusion/matrix, and find our individual selves for the first time, and then I believe we will be capable of becoming a functioning whole, a functioning humanity. Could I have your permission to reblog this? Thank you for your passionate yet thoughtful comments, Sojourner. Please feel free to share this on your blog :-). Thank you! This is important for people to read and comprehend! Thanks for your insightful article, Carol. ~ We must first of all acknowledge that they do exist. Well-said, Rosaliene! Awareness of the unquestioned assumptions we see as “normal,” “right,” and “the one truth” is essential. In my experience, most cruelty stems from childhood trauma. In contemporary society, the numbers of children who are physically and/or sexually abused is increasing, rather decreasing – owing to the systematic increase in state violence. Most of this violence is invisible (and accepted as normal), namely the systematic deprivation of the poor (who now constitute the majority in the US) of the basic necessities of life. I honestly don’t feel this violence can end without dismantling the capitalist political-economic system. I’m not sure it’s individual trauma, Stuart, but the structural societal violence you mention that fosters and perpetuates the indifference to suffering, or even the sense of pleasure some seem to gain from inflicting pain. Certainly putting profit before all else sanctions and encourages cruelty. Somehow, your comments brought Le Guin’s work to mind: http://engl210-deykute.wikispaces.umb.edu/file/view/omelas.pdf. I’m not sure dismantling capitalism is enough. Unless each person is willing to live in a way that honors all life, wouldn’t some type of collective system of governance be necessary? By it’s very existence, couldn’t any imposed system be seen as oppressive, even, as in Le Guin’s Omelas, only one suffers for the comfort of all others? I am quite astonished by the so called “walls of programming” … you are quite right when you brought it out as a anlaogy of the walls of our own society… Great post.